This Swiss Apple Tart recipe is not your usual Apple Cinnamon Tart. There’s a secret layer of crushed almonds at the bottom of the buttery pie crust and an ultra creamy, luscious vanilla custard is poured over the sliced apples before baking. 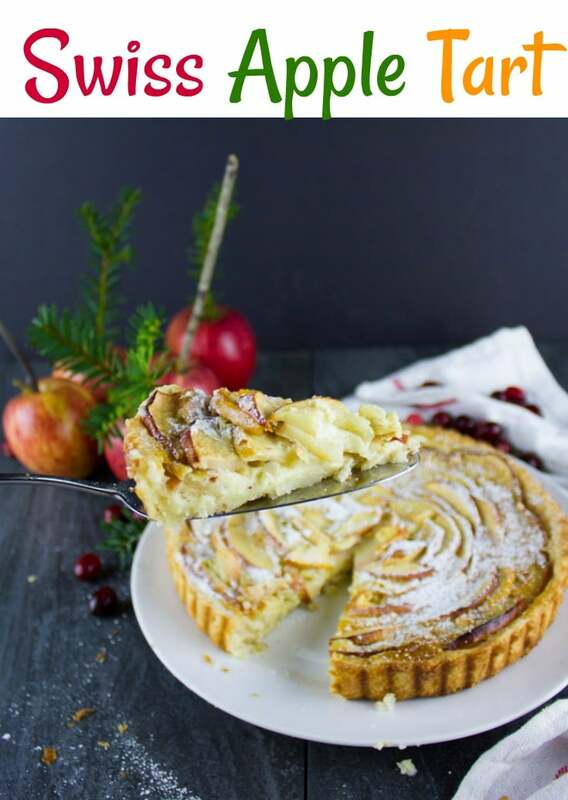 This luscious Swiss apple tart recipe is sponsored by my friends at Ontario Apple Growers —local growers of high-quality delicious apples, helping us all eat, snack and live healthily! 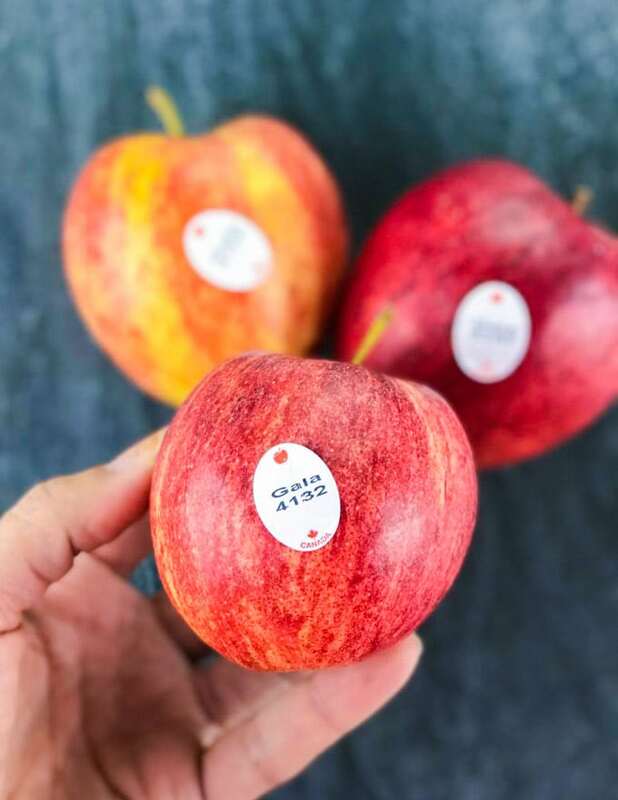 Make sure to look for the Foodland Ontario logo so you know you’re buying Ontario grown apples! Apples and this time of year are like a match made in heaven! I wait for September to go apple picking with the girls every year – it’s a tradition. 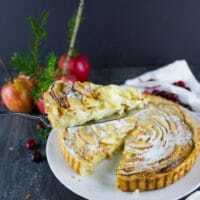 I wait for Thanksgiving to bake an apple cake or pie every year and for the Holidays, I either make an apple soup or this dreamy Swiss Apple Tart Recipe. So excited to share this recipe today, it’s my favorite Apple Tart Recipe! It’s not your usual apple pie or apple tart, it’s the Swiss version of comfort desserts. 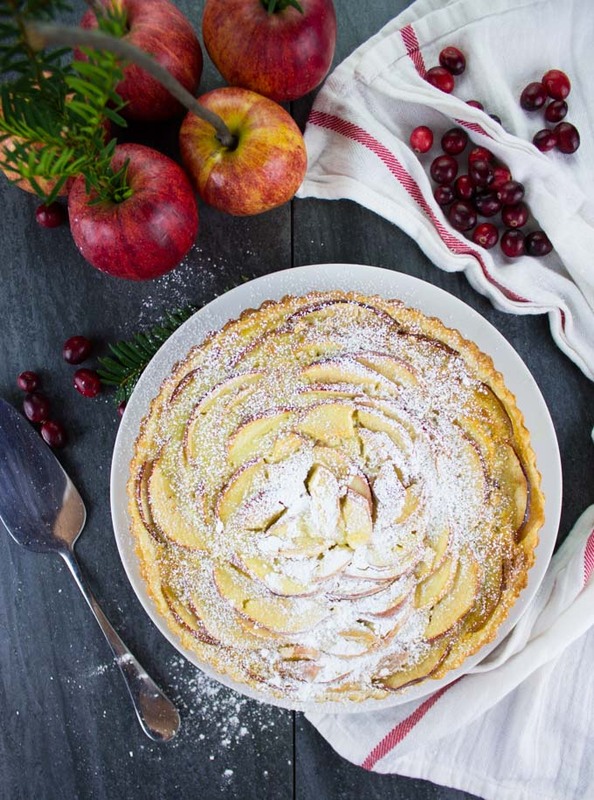 The best way to describe this Swiss Apple Tart recipe is: Divine. And here’s why. 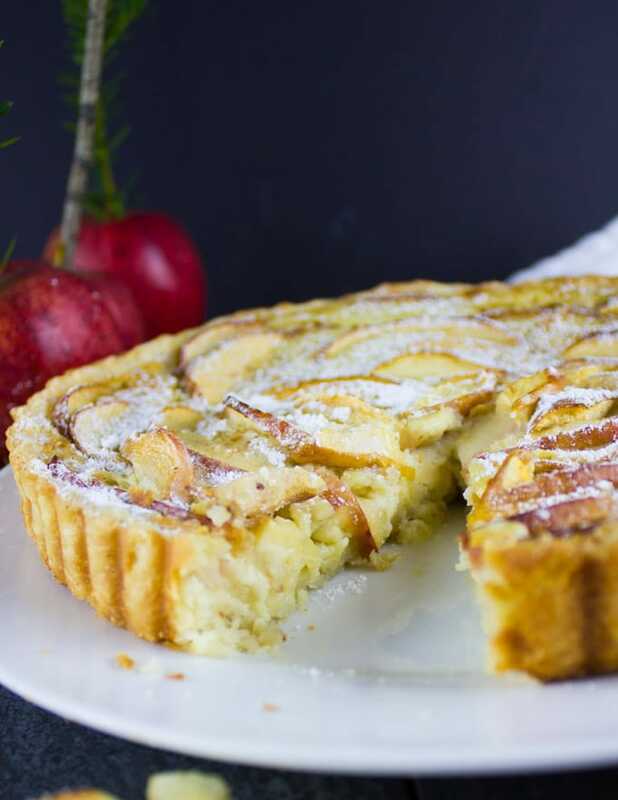 For me, this Swiss apple tart recipe beats any other. It’s the creamy vanilla custard that blends so well with the soft apples. It’s the nutty almond crunch. There’s a secret layer of crushed almonds at the bottom of the buttery shortbread crust. An ultra creamy, luscious custard is poured over the apples before baking. The result is pure apple tart heaven!! I’m ecstatic to share this apple tart recipe with you. Not just because it’s insanely delicious, but also for the reason that it brings SO many memories of the time when I lived in Geneva. I was in middle school, so yes that’s quite a long time ago, but I certainly remember much of it. Geneva isn’t really a foodie city, especially since we had moved there from Paris. I remember I missed feeling fascinated by food everywhere I looked like I did in Paris. But there were a few staples and specialties in Switzerland that made it just as unique—hello Swiss cheese fondue and Swiss chocolate fondue! Today’s apple tart recipe is another. 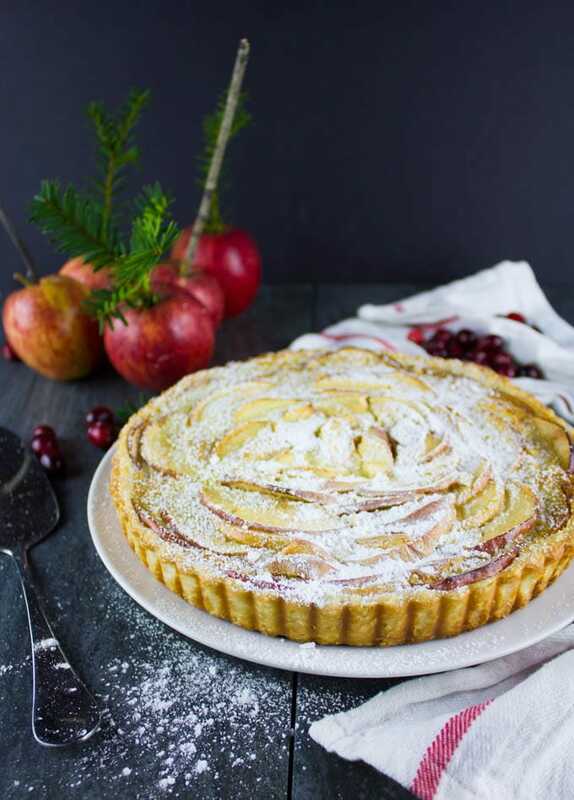 It’s more common on the German side of Switzerland and it’s not limited to apples—you’ll find this easy rustic tart with plums, peaches, pears…whichever fruit is in season! We’ve fallen in love with the apple version—the Apfelwähe. The base for this Swiss Apple Tart is basically a flaky crust ( I used my easy flakey pie dough) but you could probably also use puff pastry—but I didn’t tell you that. A secret layer of crushed almonds goes over the tart crust. This layer. OMG this layer. Not only does it add a sweet, nutty flavor of almonds and a perfect crunch to the smooth apple tart, it also helps prevents the crust form being soggy. This right there is priceless. You see this dreamy apple tart recipe has a creamy vanilla custard poured over the apples before baking. This is probably another reason why I LOVE this apple tart. It’s not your usual apple and cinnamon combo. While I LOVE that combo and I can certainly say every single person I know does too, I just love tasting apples here without the cinnamon for a change. So this recipe comes together fairly easily. Roll the dough out and transfer it to your tart pan. Sprinkle a generous layer of crushed almonds. Hazelnuts would be fabulous here too! Arrange your local Ontario apples in concentric circles over the almonds, and be as generous as you can. The more apples the better your apple tart will taste! In a separate bowl, mix some eggs, sugar, vanilla, cornstarch, cream and milk. Strain this mixture and pour over the apples. Bake till the custard has set, apples have softened and crust is golden. DIVINE. 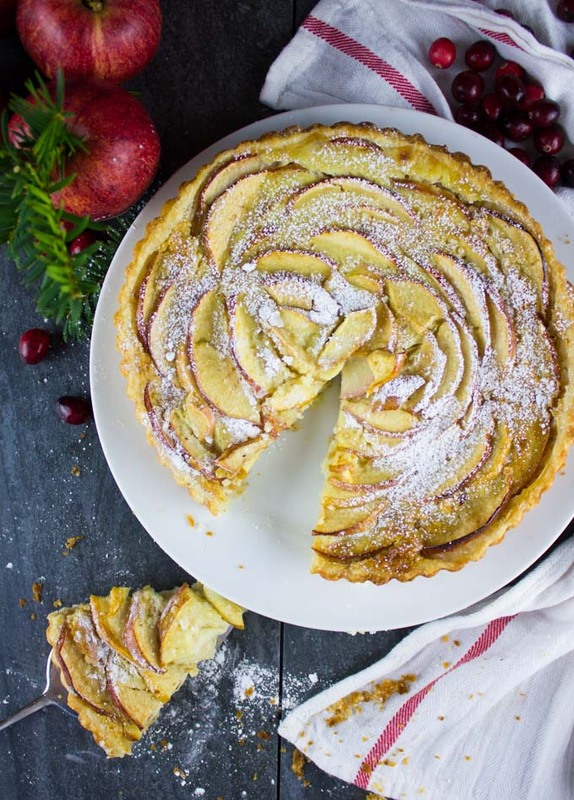 Best thing is, this Swiss Apple Tart Recipe just feels like you’re in Switzerland. If you ever visit, you’ll be seeing it, eating it everywhere! It’s one of those recipes that really perfectly reflects the comfort and sophistication of that country. 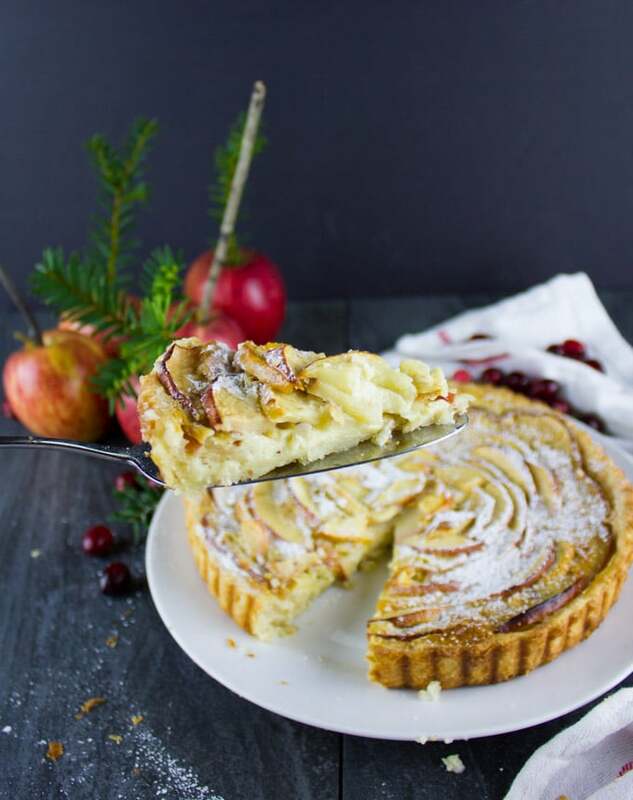 I can’t urge you enough to try this apple tart recipe, it would be perfect for your Holiday table. I picked Gala apples today because I love that flavor and texture the most. Here’s an amazing GUIDE to the different types of apples, how each tastes and what best way to use it! Feel free to use hazelnuts instead of almonds for the base. As a shortcut, you can use store-bought pie crust or puff pastry to make this recipe. For more fall-inspired Apple recipes, try my favorite Coleslaw with Kale, Apples and Pomegranate or something sweet like Apple Pie Stuffed Apples or these Baked Apples with Granola Crunch. Pure LOVE. This Swiss Apple Tart is not your usual Apple Cinnamon Tart. There’s a secret layer of crushed almonds at the bottom of the buttery pie crust and an ultra creamy, luscious vanilla custard is poured over the sliced apples before baking. The result is an elegant fall dessert perfect for the holidays! 1 recipe Easy Flakey Pie Crust with an extra 2 Tablespoons of sugar added to the flour mixture. 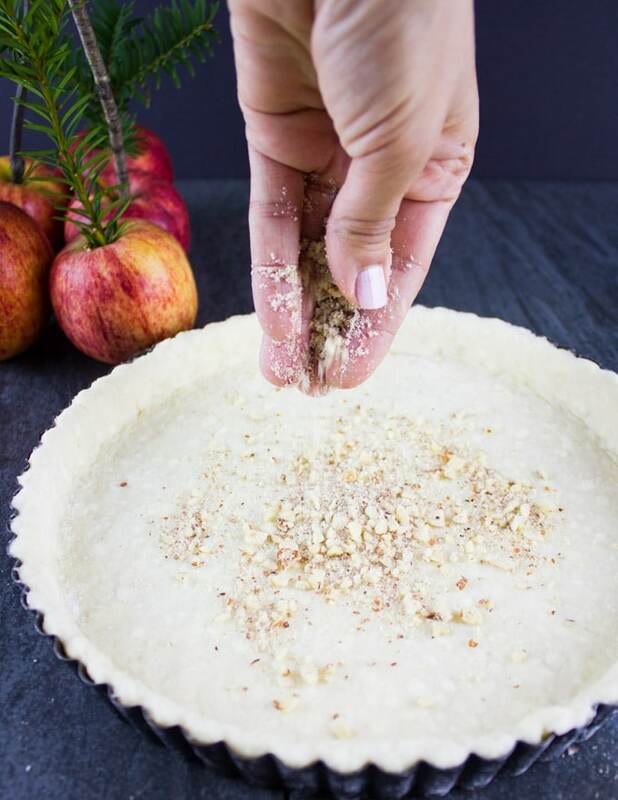 Roll out your chilled flakey pie crust and place it in a tart pan, making sure to stretch the dough. It has to be as relaxed as possible in the tart pan so it doesn’t shrink during baking. Sprinkle the almonds layer right over the crust. Take your local Ontario Gala apples and arrange them over the almonds starting away from the centre and gradually moving towards the centre. Fill up all the tart with apples and be as generous as you can. The apples will shrink as they bake so don’t worry about overfilling. In a large bowl add the eggs and sugar. Whisk them until the eggs are smooth and slightly light in color (not whipped, just well whisked with the sugar). Add in the vanilla and the cornstarch and whisk it well into the eggs too. Gradually add the cream and milk while whisking to make sure the custard is as smooth as possible. If you feel there are lumps of starch, simply strain the custard into a mother bowl and it will be smooth and perfect. 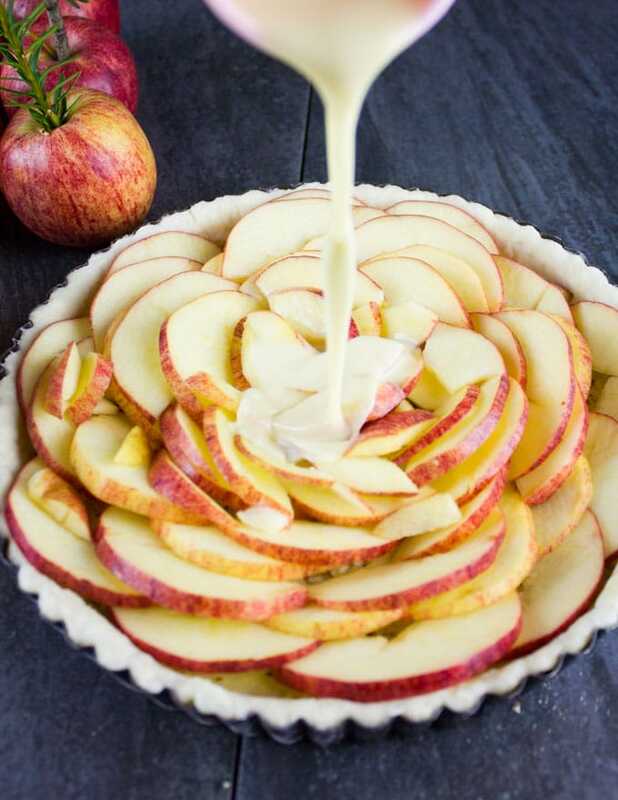 Pour the custard over the arranged apples and bake the apple tart for 40-45 minutes until the crust is golden, custard has puffed and set and apples are tender. 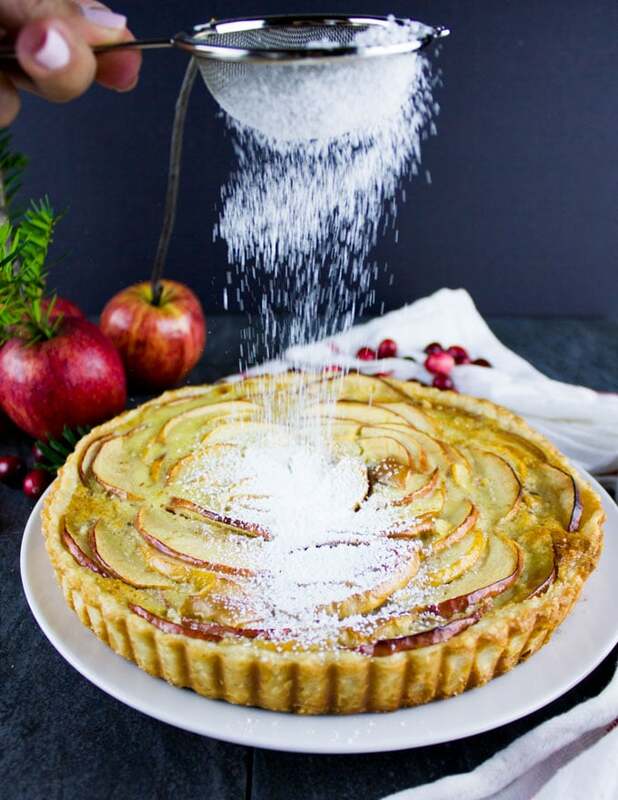 Dust the apple tart with some confectioner sugar, allow it to cool slightly and enjoy! I picked Gala apples today because I love that flavor and texture the most. Here's an amazing GUIDE to the different types of apples, how each tastes and what best way to use it! This tart looks amazing! But also easy! I have printed the recipe and will be trying it soon! Such a beautiful tart! I love anything with apples, this looks sooo good! 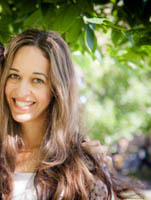 Mahy — been seeing this recipe float around the Internet, and it is so amazing! Beautiful job. Apple desserts are my fav (except chocolate – nothing trumps chocolate). 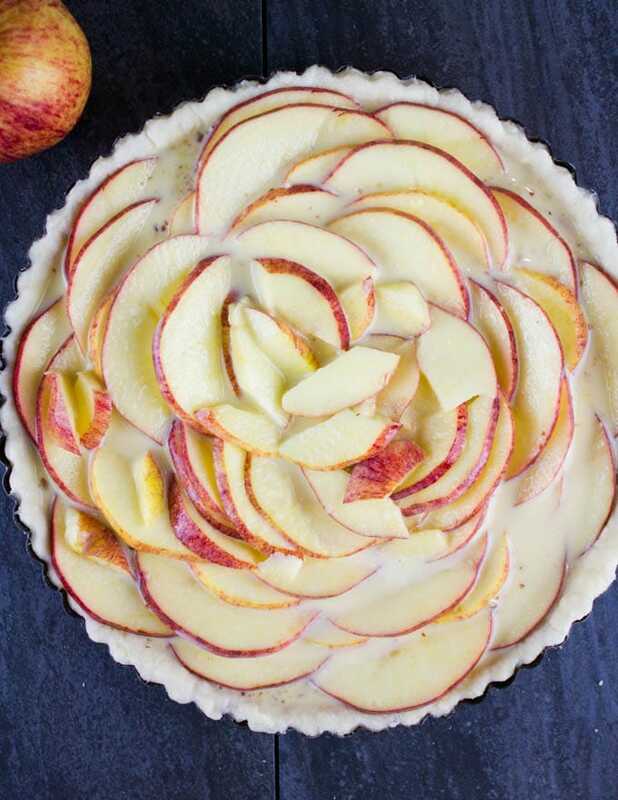 I love baking with apples – this looks just wonderful! Such a delicious tart idea. Thanks so much!! Hope you make it soon!! What a delicious looking tart! An apple tart always goes down well in my house. I love apple tart, and it reminds me of being in Paris. I really should try making it myself, as it looks simple. I was very excited to try this recipe, especially the part about shredding the frozen butter, as it sounded easier than my usual pastry/pie crust recipe. However, although it did produce a very nice dough, it was also more messy than I expected. The box grater was a mess and much of the butter stuck to the inside. It also got all over the cutting board I was grating onto. Don’t know if I’d do this again or stick to my regular version of cutting the butter into cubes with a bench scraper and freezing until ready for the dough. 1) Par-bake the crust!! or the custard will turn it soggy. 2) I didn’t need the full 2/3 cup of almonds when ground in food processor, even with a generous layer on the crust. 3) 2 apples really is plenty for a tart, especially sliced thin. 4) You CAN overfill this if you use all the apples and custard, and if that happens, again, soggy crust and custard that bakes over the side of the tart ban. If I choose to make this again I will not fill with so many apples and custard, and make sure there is room at the top for the custard to bake without overwhelming the crust. Still waiting for it to cool to try it but even with these issues I’m sure it will taste great!